Some figures in the media would have you believe that bunkers and fallout shelters are an almost forgotten relic of the Cold War days. I suspect most of those who promote that view live in high-rise towers and rarely descend to earth to mingle with folks who are more firmly grounded in real, day-to-day living. We’ve been in the bunker biz for many years now. Honestly, people have been buying shelters all over the country at a pretty steady pace for as long as I can track it … going back to pre-Y2K. Our builder has in fact been doing his thing with steel-plate shelters and saferooms for about 20 years, with installs numbering about 500 total. There are of course many other shelter builders out there—commercial and DIYers—who are fortifying homes and businesses against threats of all kinds. Clearly there are tens of thousands of private and corporate shelters in this country. Does that surprise you? Storm shelters are the most prevalent type of shelter. Folks around the Gulf of Mexico and along the southern East Coast, as well as through the midsection of the US are where we see storm shelters primarily installed. They can be below ground (if the water table allows it and if the site is not in a flood plain) or above ground (if properly anchored in a sufficient bed of concrete). Of course, the shelter structure itself must be engineered to withstand maximum storm winds and debris. Fallout or NBC shelters are what we primarily sell at Safecastle. Our customers generally recognize threats out there beyond weather and want to protect their loved ones from those many other threats as well. NBC stands for nuclear, biological, chemical, which are the primary threats that our fallout shelters shield occupants from (criminal aggression and storm threats are the others). 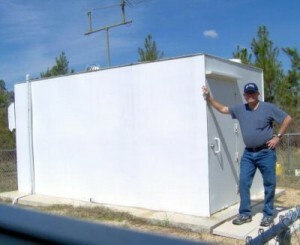 These shelters are almost always going to be underground as that is the most economical way to provide adequate shielding in a radiation-riddled environment. 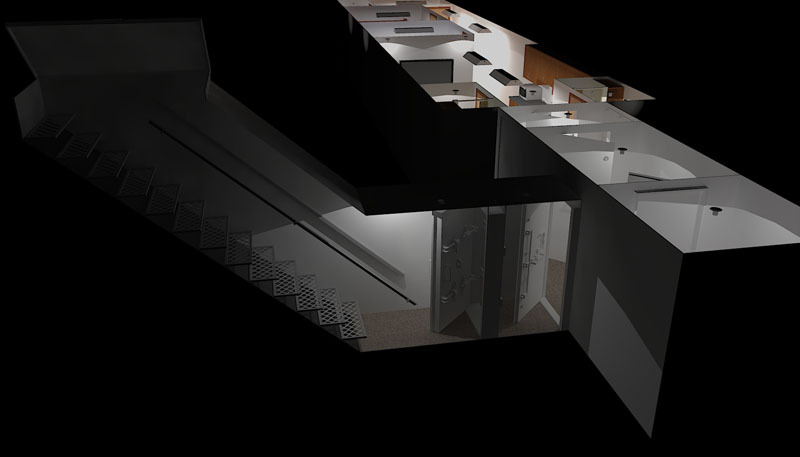 Saferooms are generally smaller shelters built into new or existing structures to provide protection from criminal entry and the safe-keeping of valuables. If anchored properly, they can also provide storm protection, and if sealed tight and equipped with positive-pressure air filtration, can protect from chemical and biological threats. As the Remington Shaver guy used to say (paraphrased)—“I was a customer before I started selling these things.” I did a great deal of comparison shopping and research about 8 years ago, looking for the most protection for the amount of money I could afford. There are a number of types of shelters out there, from concrete block to poured concrete, to prefab fiberglass and concrete, to corrugated steel pipe and more. I looked at each and took bids for my project. In fact, I had a friend here in my community who is an established concrete contractor. I was sure he would end up getting the job before he and I sat down and looked at my range of options, including final costs, based on comparable cubic feet and resulting protection levels. Boom! There really was no comparison in the end. Even that concrete-contractor friend, who was really looking forward to doing the job, advised that I go with the steel-plate shelter that was standing head and shoulders above the rest. It was just a no-brainer when all the details were in. These particular heavy-gauge steel plate shelters are as strong as anything on the market and they come in well below cost for most other types of shelters (many providing far less protection or usable space). Not only that, but they are built and installed to buyer specs and usually are ready for use on-site, installed, within a couple of months. Long-story short … my family and I were so happy with our installed steel-plate NBC shelter (what peace of mind it gives!) and we were so enthralled with the builder, that we got together with him and the rest is business-partnership history. We stand 100% behind our shelters. They are guaranteed for life for structural integrity. Needless to say—there has never been an issue with these shelters. On that note … a word of warning–I’ll have to mention that I have taken far too many calls for help from people who tried other cut-rate shelter solutions—some from local contractors who put together a quick, cheap shelter and then disappear after making some easy bucks, to those who think a shipping container is actually going to provide protection. I could go and on about this, but the bottom line is, if you are going to install a shelter and expect it to be there to save your life when you are actually at risk, then do your due diligence. No need to overpay for top-of-the-line glitzy shelters, but do not try to cut many corners either. Shelters, by necessity, have to be some of the strongest built structures around. The shelter business is about life and death. Make sure that whatever builder you go with has a proven track record and their structural engineers are certified in your state. I invite you have a look at some 3D modeling of Safecastle’s 50-foot Military-grade Fallout / Bomb Shelter. See also the Safecastle shelter site with much more info, images, price lists, online brochure, and video–including clips of The Weather Channel doing their best to destroy one of those shelters – very amusing, entertaining, and impressive. Author Bio: Vic Rantala is the owner of Safecastle, LLC, a leading retailer of survival products ranging from shelters to food storage.